Movable furniture Do they create flexible spaces? Digital signage and instruction screens. Not your usual workplace: USS Blue Ridge. 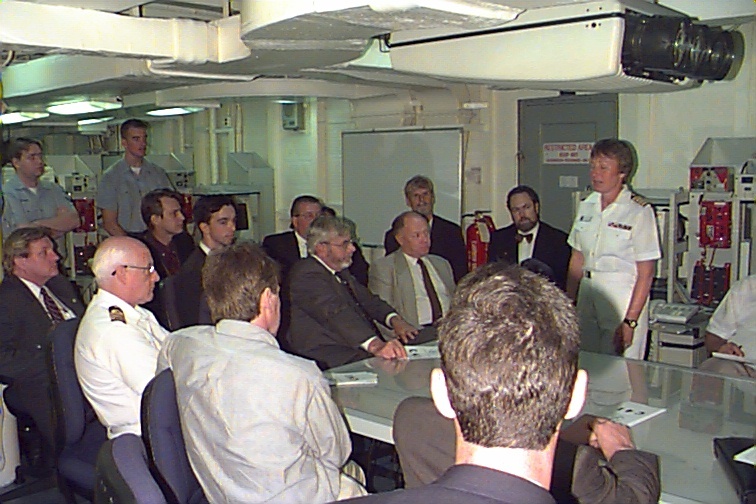 One of the more unusual learning facilities I have used is the Joint Command and Control Centre (JOCC) aboard the USS Blue Ridge, flagship of the 7th Fleet. The JOCC has a briefing area with a map table at one end and a video projector. This provides a similar environment to a small tutorial room. At the other end of the same open space were desktop computers and telephones. The walls, and ceiling are painted grey steel, with all equipment fixed in place. Tom Worthington is an IT consultant and has been an expert witness in several court cases involving international patent, computer, web and Internet issues, as well as advising governments and companies on computer problems. He is a Adjunct Senior Lecturer in the Research School of Computer Science at the Australian National University. In 1999 he was elected a Fellow of the Australian Computer Society for his contribution to the development of public Internet policy and in 2010 received an education award for teaching Green ICT on-line. In addition, Tom has an interest in architecture, environmental design, energy and water saving technology. He is the founding chair of the ACS Green ICT Group, and has been as a guest lecturer on the effects of ICT on architecture at the New Bauhaus Dessau and on smart apartment design at the University of Canberra. In 2008 I visited Delphi in Greece. Ancient amphitheatres such as the theatre at Delphi have a similar shape and proportions to a modern university forums, such as the Asia Pacific Hall of the Morris J Wosk Centre for Dialogue, Simon Fraser University. The curved stepped design is required to allow a large number of participants to not only see a speaker at the centre, but also each other. A less well known location at Delphi, is the gymnasium, about 1 km down hill from the Theatre. This has a flat exercise area, some old olive trees, and what was a covered walkway (stoa) carved into the hillside. This is where the ancient philosophers did their teaching, sitting in the stoa, discussing the students going past. On returning to the Australian National University (ANU) I noticed that the gym opposite my office has a covered walkway outside (and a Cafe). The lecturers meet to discuss educational issues here much as they would have done in ancient Greece, watching the students go past. This area performs a function as important as the formal lecture theatres, providing a place for informal interaction. While information technology has advanced in the last two thousand years, the physical and mental abilities of teachers and students have not changed greatly. Ancient wax tablets are about the same size and shape as modern tablet computers, as the hands and eyes of the ancient users are much the same as those of today. Similarly the shapes of rooms are not so different. In designing buildings for education, it should be remembered that the primary need is to provide spaces for people to interact in. The equipment and services in the building are there to help people interact with each other. The technology is there to assist human interaction, be it face to face or computer mediated. Modern lecture theatres can have sound reinforcement to allow a voice to carry further. Large visual displays can display the course materials further. However, if the students can't see each other and the lecturer can't see them, there will be little sense of being part of a joint activity. This applies to both physical and on-line learning environments. Modern materials, such as glass, can allow students to feel part of a larger body while having a quieter and secure place to study. Electronic displays can enhance the experience. Education infrastructure lost in the cloud? Will your solar panels work in a blackout? 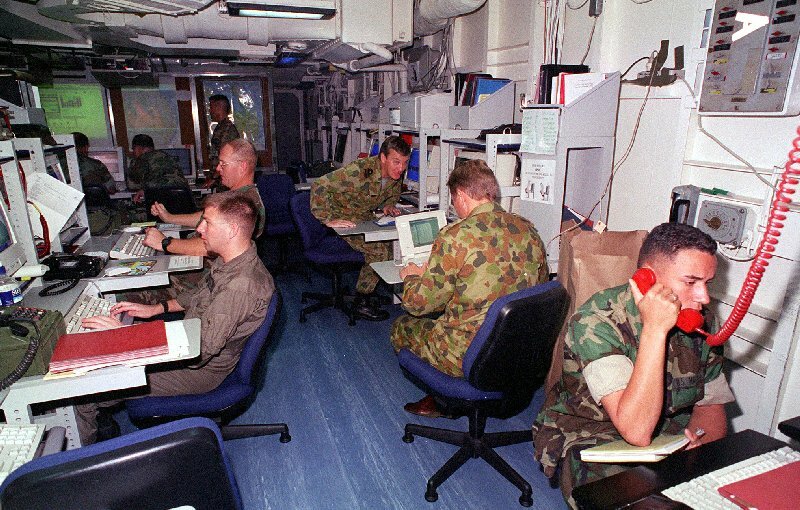 ... those physical facilities, supply chains, information technologies and communication networks which, if destroyed, degraded or rendered unavailable for an extended period, would significantly impact on the social or economic well being of the nation or affect Australia’s ability to conduct national defence and ensure national security. From: Critical Infrastructure Resilience Strategy, Attorney General's Department, Australian Government, 30 June 2010. Before using technologies such as "cloud computing" it needs to be kept in mind that these depend on a functioning global telecommunications network. In 2008 the failure of five fibre optic cables causes disruptions to Internet use for more than 70 million people ("Cable damage hits one million Internet users in UAE", Asma Ali Zain, Khaleej Times, 4 February 2008). The Council of Australasian Archives and Records Authorities has produced the useful "Advice on managing the recordkeeping risks associated with cloud computing" (Cassie Findlay, Australasian Digital Recordkeeping Initiative, 29 July 2010). Educators may consider how much they can keep local, so that education can continue during network outages and so that costs are under their control. Most educational building in Australia are designed on the assumption that mains power and telecommunications will be available. There will be a few hours emergency lighting provided to allow the building to be evacuated, but after that the building cannot be safely used. 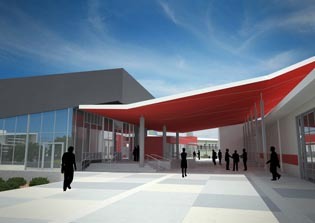 Under $16.2B Building the Education Revolution (BER) program, new school buildings were built to relevant local standards. 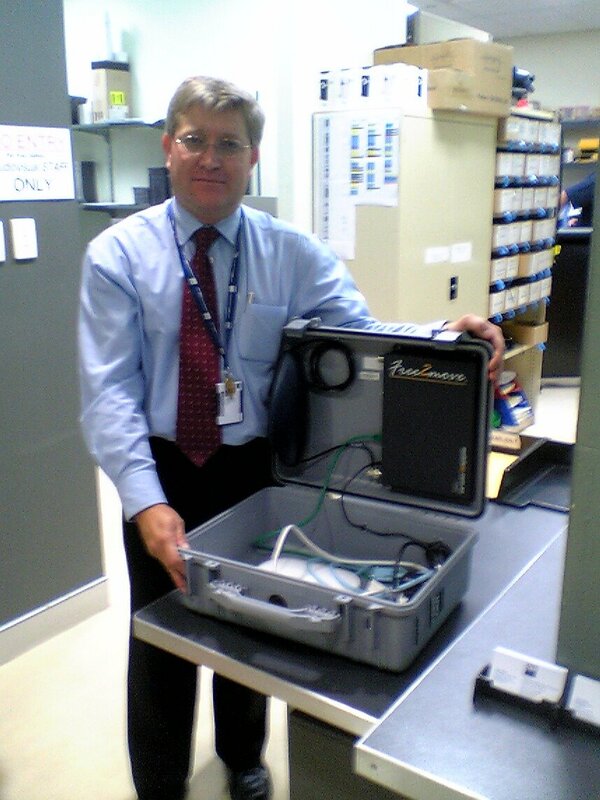 As a result schools in North Queensland received cyclone rated schools halls. Some of these buildings were also equipped with solar panels. However, as the Prime Minister admitted after the recent floods and cyclones, these buildings were not equipped to function as emergency shelters ("Transcript of press conference, Tully", Julia Gillard, Prime Minister of Australia, 17 February 2011). Also solar panels, fitted to some schools under the National Solar Schools Program, were not wired to provide electricity when the mains power failed. An example of a small, relatively simple an inexpensive detail is that the University of Canberra's new Teaching and Learning Commons have luminous contrast strips are installed on the stairs. These strips will glow without the need for electrical power, providing a useful supplement to the usual emergency exit lights. 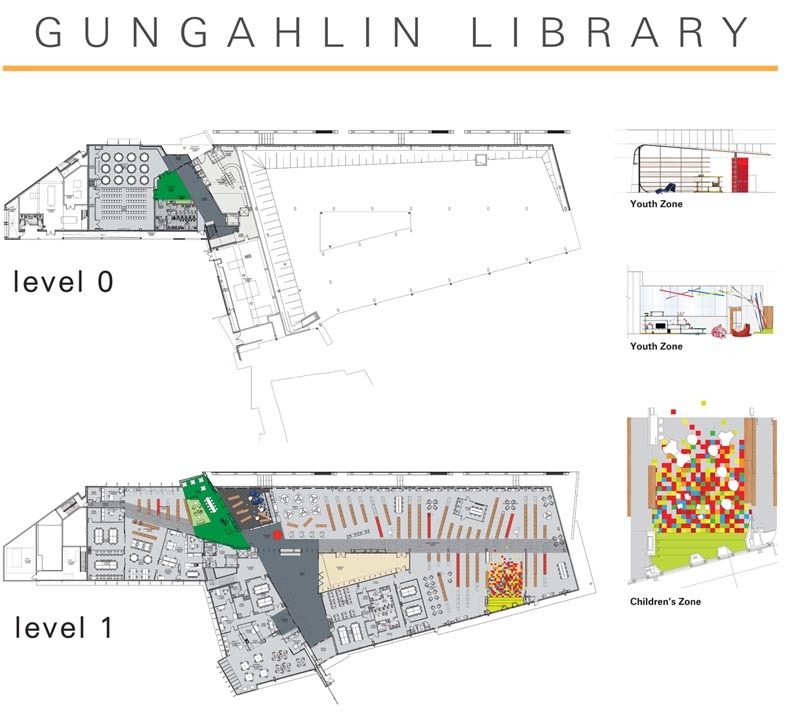 The new $72.4 million Gungahlin College in Canberra would provide a good example of a facility which could be upgraded at low cost for emergency use. The College will accommodate 900 upper secondary students and include a CIT learning centre (for vocational TAFE education). The college library will be available to the community, providing the local public library, with learning rooms for adults and children. The building is planned to have a 5 Green Star design rating from the Green Building Council of Australia. The ACT Government aims to install photovoltaic (solar power) systems at all public schools over the next four years. A small additional investment would allow this facility to be available for emergency use. Movable furniture: Do they create flexible spaces? Amongst Kathy's many insights was that furniture had to be light and easy to be movable. In one example, the furniture could be rearranged, but was so heavy, this did not happen. Flexibility is provided by the Queensland University of Technology Mobile Collaboration Workstation. 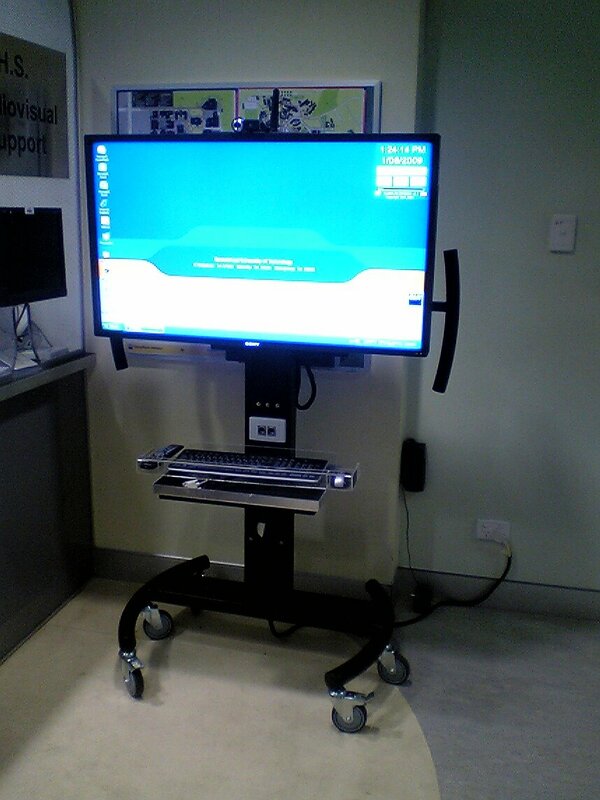 This is a large flat screen display (Plasma or LCD) on a mobile cart, with a standard PCs, video conference camera and microphone, wireless keyboard and mouse. Some units can be checked out by staff for use in teaching rooms, saving having to equip each of the smaller rooms with equipment. 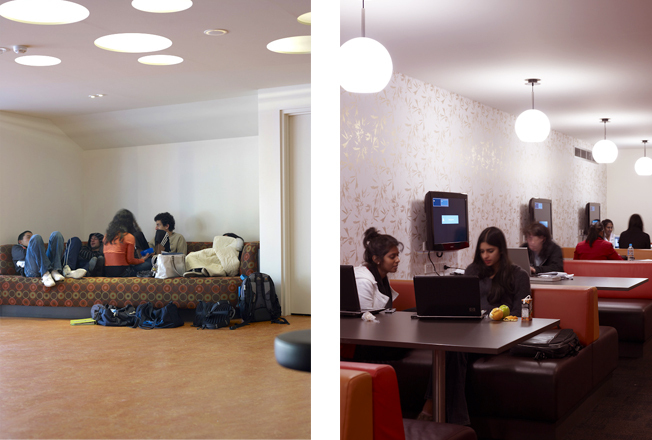 Other units are permanently tethered in the library for use by student groups. The library also has screens, desks and chairs which can be easily moved around by students top create their own rooms. However, if the equipment and furniture is too "mobile" there are risks of damage and theft. Also time needs to be taken to configure the room for each use. Mobile furniture and equipment can cost more due to the need for light weight and robustness. The Animated Work Environment at Clemson University takes flexibility to an extreme. In this experimental arrangement, proximity sensors detect what the users are doing and adjust not only the lighting level but uses motors to move panels suspended above and around the users, to change the shape of their work space. At a more practical level RMIT Library's jelly bean tables provide a simple way to provide enough space for one person, their books and either a desktop computer or a laptop. The Eora Exchange UNSW provides booths which will seat six students around a fixed table, with a projection screen fitted to the adjacent wall. The Ian Ross building ANU has a space which can be divided in different ways as required, using the same floor to ceiling partitions on tracks as used in conference centres. However, such ballroom partitions are rarely moved as they require several people to operate and for all furniture to be moved from the path of the partition. The University of Canberra opened a new Teaching and Learning Commons in 2011, just above the refurbished refectory. The learning space is a mezzanine, allowing the students to look down at what is happening in the refectory. A walkway and bridge allow access to rooms placed around the periphery of the building. The floor is divided into sections, each for a different style of learning with a different level of formality. At one end the "Teaching Commons" has has a glass wall with its own doorways, an open area, with a kitchen and the several breakout rooms. This allows a class to have an area to themselves and then to use several breakout rooms. What also makes the space interesting is that the University of Canberra Teaching and Learning Centre is co-located in the space. In a way the physical space is a physical manifestation of the style of education being advocated. Recent Changes Camp 2011: Canberra was one of the first events to use the new facility in January 2011. One room, described as "The HotHouse" was used for brainstorming. This has all the walls are painted with gloss white whiteboard paint (IdeaPaint brand), allowing them to be written on from floor to ceiling. Short throw Epson projectors fixed to the ceiling provide a 2 metre picture on the whiteboard wall surfaces. wall sockets provide for a laptop to be used as the source of the image, or a PC in a central cabinet can be used via a plugged in keyboard. Circulation areas of the University of Canberra Teaching and Learning Centre have wall mounted flat screen displays. By default these are used for digital signage, displaying announcements of events. However, the screens have the same auxiliary input and PC facilities of the projection screens and can be used for presentations. During Recent Changes Camp 2011: Canberra a laptop was used to provide a group document preparation display. Participants were able to input text using their own net-book, laptop or tablet computer and then add this via the center WiFi to update the wall screen. The digital signage is located in an intermediary lounge area outside the more formal classrooms. A glass wall separates this area from the corridor. This allows the digital signage to still be seen from the corridor, but secured by locked glass doors. Learning Commons Technology: The dos and donts in developing learning commons by Tom Worthington is licensed under a Creative Commons Attribution-Noncommercial-No Derivative Works 2.5 Australia License.